I have spent the last few days looking at the relationship between using the library and dropping out of an undergraduate degree. I have some more results for you, but these ones are coming with a very big health warning – so, treat with caution! You might remember that back in the very first blog I talked a bit about where your data comes from, and making sure that it is appropriate for the task at hand. Well, we’ve uncovered a slight problem with the Huddersfield data. Quite early on, it became clear that the information we had for ‘year of study’ was not accurate for every student. This is a challenge for two reasons. First, we don’t know whether usage patterns are the same for all three years of study, so we don’t want to compare different year groups without controlling for any variations that might be related to the year that they’re in. And second, we can’t use cumulative data to measure usage: the total usage of a third year student over their three years of study is likely to be higher than the total usage of a first year over their single year of study, but that doesn’t mean the student is actually more likely to use the library: it just means they’ve had more of an opportunity to do so. Our initial workaround for this was to focus exclusively on final year students, who we could identify by checking to see whether they have a final grade or not. That was fine for the demographic stuff; it gave us a decent sized sample. But now we’ve moved on to look at dropouts, things have become a bit more complicated. The lack of ‘year of study’ data has become a problem. We can’t use our ‘third year only’ workaround here, because the way that we were identifying the relevant students was by looking for their final grade: and, of course, if you’ve dropped out, you probably won’t have one of those! Also, we needed the first and second year students involved, to make sure that we could get a big enough sample for the statistical tests. So what did we do? Well, first of all we had to find a way around the ‘cumulative measure’ problem that I mentioned above. Our solution was to create a binary variable: either a student did use the library, or they didn’t. In general, it’s not desirable to reduce a continuous variable to a categorical one – it limits what you can understand from the data – but in this instance we couldn’t think of any other options. Even this still doesn’t completely solve the problem. Students who have been at Huddersfield for three years have had three times as long to use the library as those who’ve only been there for a year: in other words, they’ve had three times as long to move themselves from the ‘no usage’ category to the ‘usage’ one – because it only takes one instance of use to make that move. To try and get around this, we only looked at data for 2010-11 – the last year in our dataset. For the same reason, we’ve only included people who dropped out in their third term: this means that they will have had at least two full terms to achieve some usage. Now, this is only a partial solution: we still don’t know whether usage patterns are different in first, second, and third years, so we are still not comparing apples and apples. But we’re no longer comparing apples and filing cabinets. Furthermore, before I share the findings (and I will, I promise!) I must add that we could only test this association for a combination of full- and part-time students. Once you separate them out, the test becomes unreliable: the sample of dropouts is too small. So we don’t know whether one group is exerting an unreasonable influence within the sample. In short, then, there’s a BIG health warning attached to these findings. We can’t control for the year of study, and so if there’s a difference in usage patterns for first, second and third years, our findings will be compromised. We can’t control for full- vs part-time students, so if there’s a difference in their usage patterns our findings will be compromised. Both of these are quite likely. But I think it’s still worth reporting the findings because they are interesting, and worthy of further investigation – perhaps by someone with more robust data than we have. 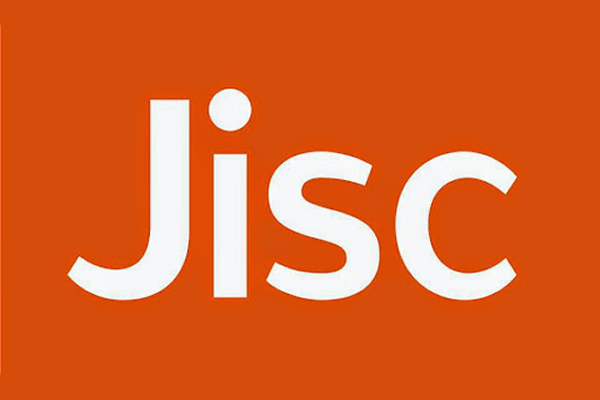 First up – e-resource usage. The findings here are pretty clear and highly significant. If you do not use the library, you are over seven times more likely to drop out of your degree: 7.19, to be precise. If you do not download PDFs, you are 7.89 times more likely to drop out of your degree. 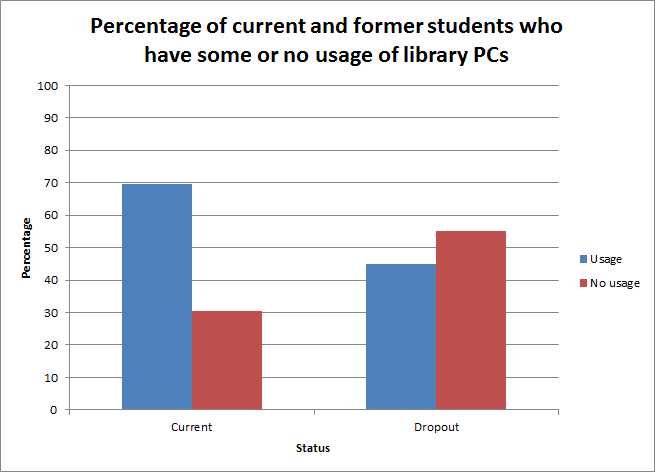 Library PC usage also has a relationship with dropping out, although in this case not using the PCs makes you 2.82 times more likely to drop out of your degree. We tried testing to see whether there was a relationship between library visits and dropping out, and item loans and dropping out, but in these cases the sample didn’t meet the assumptions of the statistical test: we can’t say anything without a bigger sample. So why are these results interesting? Well, it’s not because we can now say that using the library prevents you from dropping out of your course – remember, correlation is not causation and nothing in this data can be used to suggest that there is a causal relationship. What it does offer, though, is a kind of ‘early warning system’. If your students aren’t using the library, it might be worth checking in with them to make sure everything is alright. Not using the library doesn’t automatically mean you’re at risk of dropping out – in fact, the number of students who don’t use the library and don’t drop out is much, much higher than the number who do leave their course prematurely. 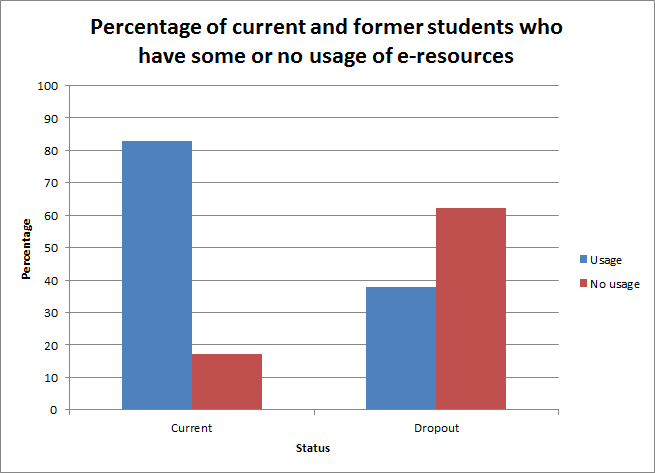 But library usage data could be another tool within the armoury of student support services, one part of a complex picture which helps them to understand which students might be at risk of failing to complete their degree. Thanks so much for sharing this data, really interesting. I wonder whether any library data was included in projects such as STAR-Trak for identifying potential dropouts? Having this sort of information from across the university to pull together and understand more about our students should really improve student support (and ultimately retention). Thanks again for sharing your findings.